Northern Ireland's Secretary of State Karen Bradley and Sinn Fein MEP Martina Anderson exchanged words at the Balmoral Show. 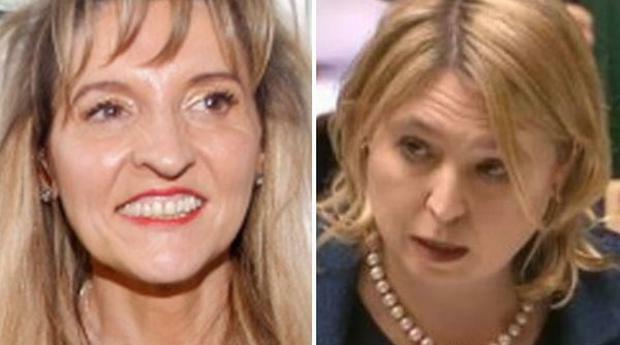 A row erupted at the Balmoral Show on Thursday between Northern Ireland Secretary of State Karin Bradley and Sinn Fein MEP Martina Anderson. The pair had a frank exchange of views on the issues of Brexit, legacy and a border poll after Mrs Anderson confronted the Secretary of State when they ran into each other at the event. Tensions have been high in Northern Ireland politics in recent weeks with issues surrounding the Irish border after Brexit and dealing with Troubles legacy issues in Northern Ireland dominating the discussion. On Monday it was reported that Prime Minister Theresa May was not confident of Northern Ireland remaining within the United Kingdom in the event of a border poll. Mrs Anderson told the Secretary of State that as far as Sinn Fein were concerned there had been a demonstrable change in opinion on the need for a border poll in Northern Ireland. "I think the evidence that we've had from opinion polls, shouldn't be dismissed," Mrs Anderson said. The Conservative MP for Staffordshire Moorlands said the government would address the points that were made. Things became heated when Mrs Anderson started to talk about her concerns around Brexit. "Brexit is something we are seriously concerned about, and there is a backstop and a protocol in place that will allow the North at least to stay in the custom's union," the MEP said. "We don't accept the backstop thats been set down by the EU, we are working on a backstop that we are happy with and we'll be bringing that forward," the Secretary of State replied. "Your Prime Minister wrote to Donald Tusk and actually said that they agreed that there needed to be a backstop," Mrs Anderson fired back. The Secretary of State tried to turn attention back to the Balmoral Show. "We all agree with that, we don't agree with the text that's been put forward by the EU but let's not talk about that we are here to enjoy a great show," Mrs Bradley said. "We are here to enjoy a brilliant show, but we are not going to be collateral damage and there can be no dilution of our rights," Mrs Anderson told her. The Secretary of State attempted to end the conversation but Mrs Anderson pressed her on legacy funding. "We are waiting on the Department of Justice," Mrs Bradley replied. Mrs Anderson said that the Secretary of State had made "disgraceful" comments on legacy and Mrs Bradley then ended the conversation and left. Kathy Armstrong A TEENAGE girl is in critical condition after being stabbed in the neck.